A new report by the Center for the Study of the Drone finds that more than 900 public safety agencies have acquired drones. Photo courtesy of the Tulare County Sheriff. The number of U.S. public safety agencies with drones continues to grow. 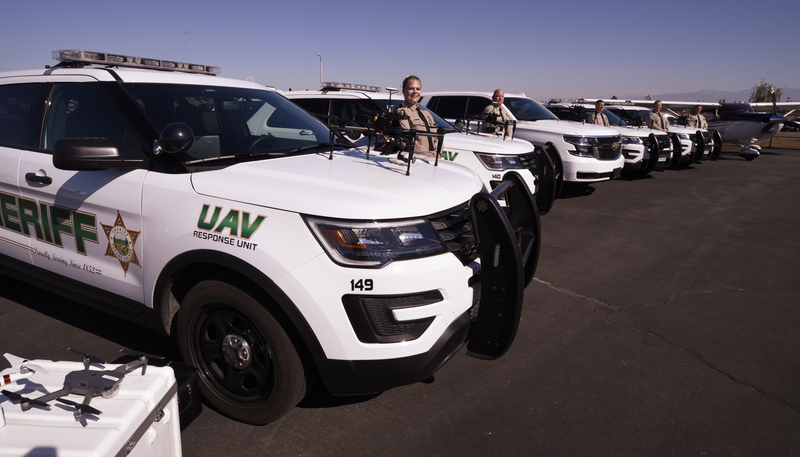 A new report by the Center for the Study of the Drone lists more than 900 state and local agencies around the country that have acquired unmanned aircraft and compares the data to the use of manned aircraft for public safety. Read the full report here. The U.S. Air Force will temporarily deploy MQ-9 Reaper drones to Larisa Air Force Base in Greece. In a statement to Defense News, a Pentagon spokesperson said that the deployment was necessary due to ongoing repairs at an undisclosed drone base. It is the first known deployment of U.S. drones to Greece. A report by the U.S. Government Accountability Office examines the safety risks posed by drones. A report by the U.S. Army’s Strategic Studies Institute looks at the ways in which robotics and unmanned systems can improve soldier effectiveness. At TomDispatch, Rebecca Gordon argues that the Trump administration is expanding the U.S. drone program to target militants. At the Japan Times, Kazuaki Nagata looks at how Japan is on the cusp of permitting drone deliveries in rural areas. At the Drone Radio Show, Mark Nisbet, Nick Flom, and Wes Shover discuss the possibilities for beyond line-of-sight commercial drone operations in the U.S.
At CNBC, Lora Kolodny profiles a U.S. startup developing cargo drones that can carry heavy loads over long distances. “Elevation,” a short documentary by Dezeen, explores the ways in which ubiquitous drones could change cities.